By default the devices on the same VLAN only can communicate with each other. To allow communication between different VLANs you can configure inter-VLAN routing between them. In a traditional inter-VLAN routing setup, each router interface is connected to a separate network through a switch port, which is also associated with a specific VLAN. The router accepts traffic on its interface from one VLAN through switch and routes the traffic to another VLAN. The following figure explains the scenario. 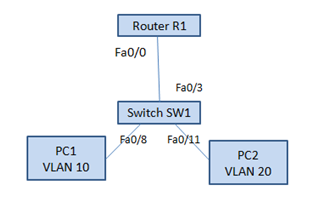 The Switch SW1 has two VLANs VLAN 10 and VLAN 20 configured on interfacesFa/08 and Fa0/11 respectively. The switch ports Fa0/4 and Fa0/3, which are also the part of VLANs 10 and 20 respectively, are configured to router interfaces. Also, PC 1 is configured on VLAN 10 and PC 2 is configured on VLAN 20. In this setup, you are configuring each VLAN on a separate router interface. You can configure multiple VLANs on a single interface using Router on stick inter-VLAN mechanism. To configure Router on stick inter-VLAN mechanism,you need to configure the router’s interfaces as trunk links. Let us create a Router on stick setup where a single router interface is configured as a trunk link. The router will accept the tagged VLAN traffic on its trunk interface and route traffic between different VLANs. To do this, you need to configure IP addresses on the router interfaces, which would be used by computers on VLAN 10 and VLAN 20 to accessthe devices connected to each other. The router may use routing table to forward data to the correct device, if the destination address is on adifferent VLAN. Let us configure the setup shown in the diagram given below. The Router R1 is connected to switch SW1 on trunk port F0/3. VLANs 10 and 20 have also been added to switch SW1. PC1 and PC2 are connected to VLAN 10 and VLAN 20 respectively. Set interface fa0/3 to trunk mode. Remember, you cannot use the switchport mode dynamic auto or switchport mode dynamic desirable modes to create trunk on the router because the routers do not support dynamic trunking protocol. Configure router with IP addresses to perform the inter-VLAN routingso that the router can route frames between VLAN 10 and VLAN 20. Use interface interface_id.Subinterface_id command to create sub interfaces. Next, assign VLAN ID using the encapsulation dot1q vlan_id subinterface. You also need to configure the router with the default gateways that you have configured on the PC1 and PC2 and assign IP address to the sub interfaces if the router. View the router configuration using the show running-config command in privileged EXEC mode to verify the router configuration. Ping PC2 from PC1 to check if both the PCs in different VLANs can connect to each other. The routerinterface on switch is not configured as a trunk and the port is left in the default VLAN mode. To resolve the problem, use the switchport mode trunk interface command on switch to enable the connectivity between the switch and router. Q1. In which of the following ways does Router on stick inter-VLAN method configured? You can configure multiple VLANs on a single interface using Router on stick inter-VLAN mechanism. In the router on stick inter-VLAN method, each router interface is connected to a separate network through a switch port, which is also associated with a specific VLAN. 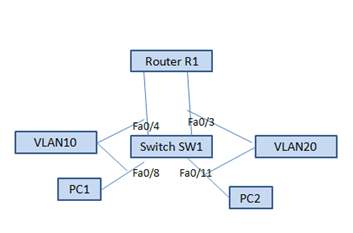 When Router on stick inter-VLAN method is configured, you can configure multiple VLANs on a single interface.